This area is where you get yourself and your shop ready for the build. Some of the things I held off on just so I could get building (like shop prep for cold weather). Getting familiar with the education on how to do composite work will do a lot for you as a builder, so do take some time to go over these aspects. The first thing I did for the shop was to build my construction table. There are many ways of doing this. I went for a simpler box frame with corner bracing and cross supports. I made the top easily removable in the event I had damaged it too much. This may or may not be necessary, but it's good to have options. 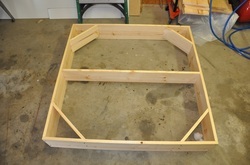 I also decided to build the table in two parts: one 4 x 8 foot and one 4 x 4 foot. This will give me some flexibility down the road if I need more space but don't need the full 12 feet. I also put the table up on height adjustable casters so that I could not only move the table around at will but also level it easily. It's come in very handy several times already. To attach the casters, I welded a nut to a flat piece of steel with three holes in it. The middle was for the caster stud, the other two were for screws to attach it to the bottom of the leg. I drilled out an area for the stud to fit into and installed the assembly. I added a nut to the stud to act as a thread lock. The trick with having two tables is that it is harder to level both sides, but I decided the effort would come in handy later. One problem I ran into was that my caster bent one time when I had it adjusted out quite a bit. So I've resolved to having it almost all the way in and will use spacers to do large changes and the caster for small changes. 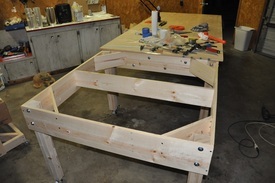 EAA posted an article on building a work table using the metal studs that you find in a lot of business construction. The idea is that these are made to be straight and warp less with time. Had I thought about them the first time, I probably would have used those instead. If you can find the article, I would recommend going that route with the build. The next item on the list was construction of a fiberglass storage box. 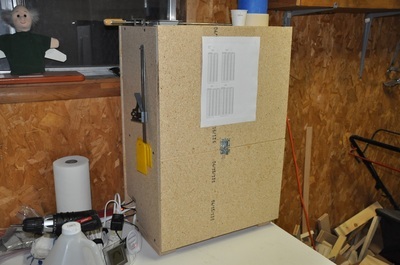 I considered permanently mounting it to a work table I had, but decided later to make a movable storage cabinet. This gives me some flexibility in where I can have the cabinet and I can leave the table more open for other things when needed. 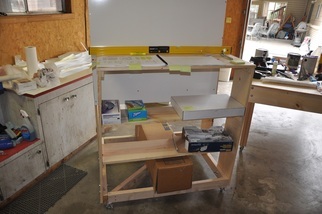 I also installed shelves to hold items for the build as well as a spot to lay the plans to read. 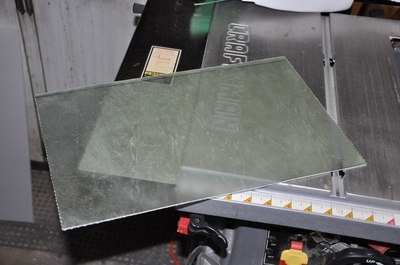 The cabinet has a door that keeps the glass sealed from dust, but drops down to be a cutting table with guide lines on the surface for cutting angles. The door material is dry erase, so I can use it to draw out things when needing to figure something out. This has worked well, though the cutting table portion is on the short side. I've made it work, but I have thought about making an extension. We'll see how things go. 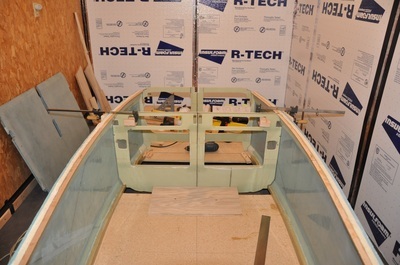 The fiberglass hangs on large dowels so it can be pulled down from the roll. I need to add rollers to aid in the turning, but overall this has worked well. You can see more pictures in Tools And Shop Setup. The epoxy system I chose to use is the MGS system. This is suppose to have some of the best properties (low viscosity, low odor, high softening temp, etc...) This system also has a unique property of allowing the user to pick a cure time by mixing fast and slow hardener with times between 15 minutes to 6 hours. The biggest issue is that the slow hardener must ship in packaging that costs more than the material does and MGS can have supply issues sometimes. If you can go straight to the supply store, then you could save on the shipping. The other thing that helps is using mostly fast hardener with small amount of slow. I found that I was using more slow hardener than I really needed to. When it came to building the heat box that you see everyone doing, I decided to follow Jerry Schneider and use heating pads instead of light. That way the heat is focused to where it's needed and you're using all the electricity to make heat and not wasting some to light. I just kept the pads on low and this seemed to be sufficient. 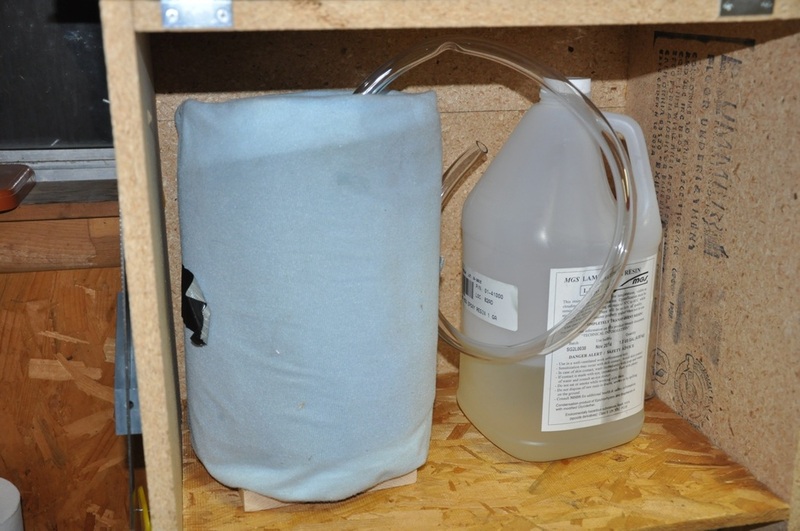 I also followed his idea of making a resin dispenser and leaving the hardener in the cans. We'll see how this works out, but I have no reason to believe it won't. I tried using the West Pumps on the hardeners, but the hardener kept crystallizing in the tubes and spouts. By leaving it in the can and just pouring out what's needed, this should avoid that issue. The epoxy box, closed up. The action area. This was the original design, but was redesigned for easier use. 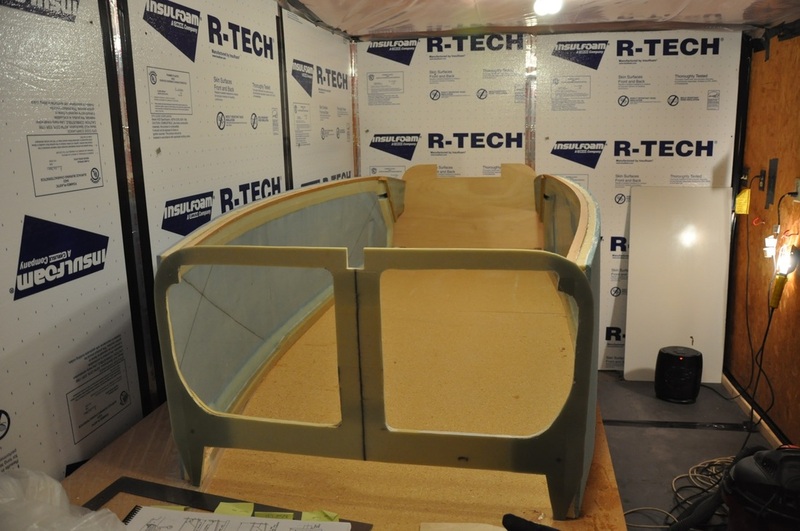 Plastic sheet was added to the bottom to avoid epoxy absorbing. The storage container in the top feeding a valve in the bottom for dispensing resin. Extra resin on hand when needed. 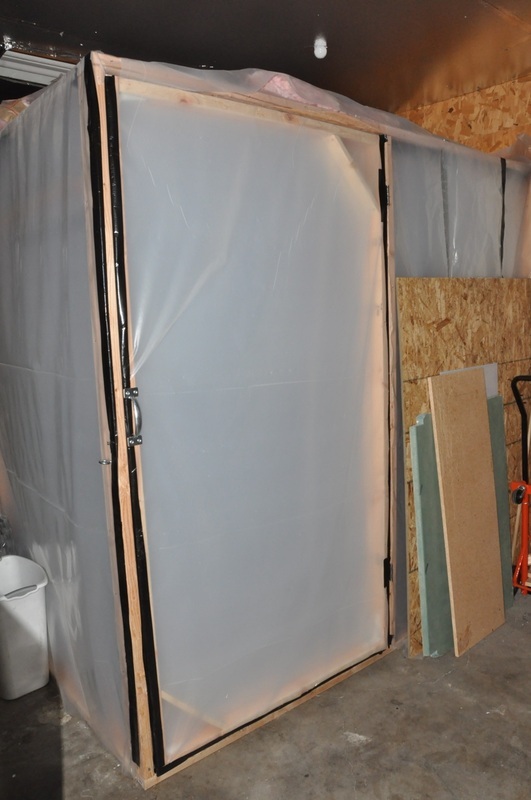 One thing every builder should prepare for ahead of time is cold weather. Composites do not like working below 70ºF. Most instances of trapped air in the layup (including my own) have come from temperature getting too cold. Unfortunately, I was hit hard when the winter weather showed up sooner than expected and I had to scrap an entire side because of trapped air. Things get cold in the Salt Lake area, so to build through the winter, drastic measures must be taken. The shop is rather large and minimally insulated. There is also only electricity to feed it (no gas lines), so heating the entire area could be costly. 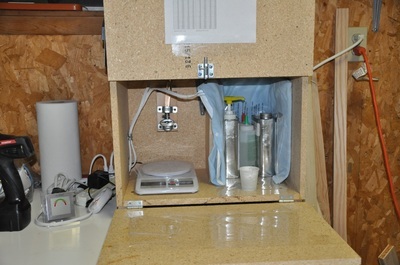 In order to continue building, a temperature controlled environment had to be set up. This appears to be building a small insulated heated area to do the work in and curing. I designed a structure in Google Sketchup (I don't have access to a CAD program) that made an area small enough to easily heat but large enough to work in. This was constructed with 2x3 studs to keep the cost down. I then attached 6 mil plastic sheet to both sides of the studs to create an insulated gap. I then used insulated ducting to duct my 220V heater over to the room. Despite all this, it wasn't enough and my heat loss was too great. So I upgraded the area by adding fiberglass mats to the ceiling where most heat would be lost and covering the walls with Styrofoam insulation sheets. I graphed temperature over time using different heat sources and found my 220V heater, which was on the other side of the shop and had to be ducted in, just wasn't working well. It would probably work wonderfully in the room, but I don't have a 220V outlet there. A propane heater that attaches directly to the bottle can get the room up to temp in about 30 minutes, though it produces some moisture. I don't stay in the room while it's heating since there could be air issues, so it's used as a preheater. I then switch to a standard 120V heater which was able to maintain and even increase the heat in the room. I was at 72ºF while outside temp was 29ºF. The room still decays in heat faster than I like, but at least it's adequate. The electric heater makes it safer to work in the room as well. This combination allows for quicker startup. An electric blanket on the parts to be glassed would aid in preheating the material ahead of time. The project was starting to take up too much space in the heat room since I'm now having to work on multiple pieces. As such, it was time to expand the work area. So the walls came down and work was set to insulate the ceiling and walls better. For the ceiling, I used metal studs from the home improvement store to re-enforce the foam boards on the ceiling so they could hold the R-38 fiberglass insulation that I put in. With the foam, this will give me a near R-40 insulation. 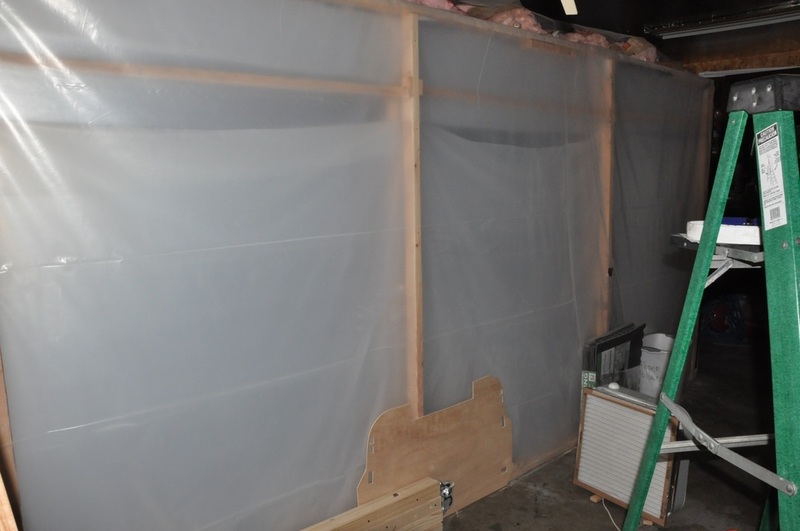 For the walls, I had someone come in and blow in fiberglass since the walls were finished and I couldn't install batting. I wanted to do the urethane foam injection, but the cost was prohibitive. Hopefully this will work well for the winter time, but time will tell. Once the shop was in order and Chapter 3 had been read a few times, it was time to give things a try. The first thing I did was take small pieces and wet out glass on top of plastic. It was minimal material to keep cost down and just gave me an idea of what to expect. It also allowed the plastic peel ply method to be tested. The next piece is the 6 plies of BID cut into retangular pieces. No foam in this one. This project allows you to get use to wetting out glass, adding more layers, and removing bubbles. It also will help to educate on how well your resin to glass ratio is. Once the piece has cured, it gets cut to a specific dimension (12" x 16" I believe) and then weighed to find the total weight. The plans will have a weight range that the piece should fall in and will let you know if you're too wet, too dry, or within target. It also says to hold onto it for later, but it doesn't say why. Apparently, this is to become the main wing vortilons later on. 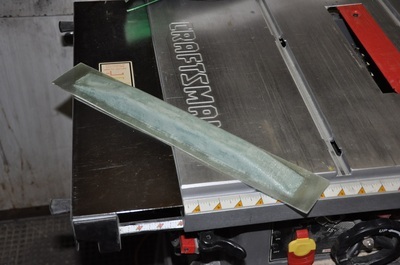 The next practice piece involves cutting a piece of PVC foam out, shaping it, then laying up four layers of glass on each side of the piece: 2 UNI and 2 BID per side. Once cured, it gets trimmed, then strength tested by placing it on an edge or a broom handle and applying weight to both ends. 200 lbs of force on the piece equates the force of a 10 G crash. If this doesn't build confidence, I don't know what will. Couple of things I learned doing this piece. One is that I needed to round the foam more on edges to get the glass to lay right. The other was that I made the micro too dry and had a hard time spreading it thin and even. I wasn't happy with the work, so I redid with a smaller piece of scrap and was much more pleased with the results. I decided I was ready for building even though there were other practice pieces, but I was anxious to get on with things. With that, it was on to the build!